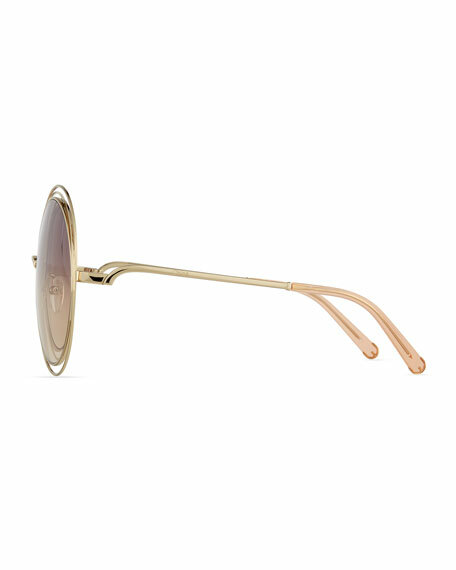 Chloe Carlina round sunglasses in gold-tone metal feature concentric frames. 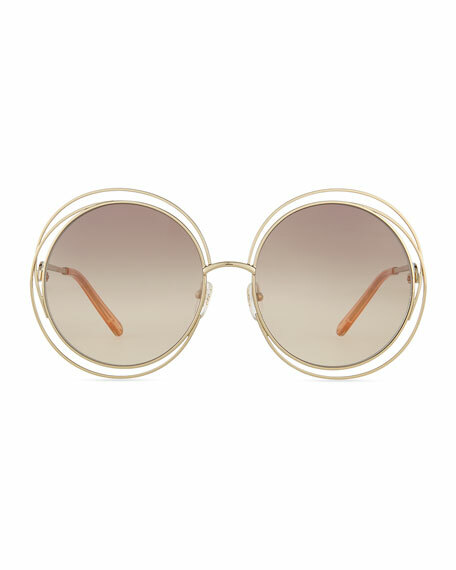 Chloe "Vera" round sunglasses in plastic. Lens/bridge/temple (in mm): 56-20-140. Gradient lenses. Scalloped frames along brows. Golden hearts and sun motifs and metal hinges. Logo detail at temples. Open tips. Can be fitted with prescription lenses. 100% UVA/UVB protection. Made in Italy. Roberto Cavalli geometric sunglasses in metal. Lens/bridge/temple (in mm): 63-18-125. Gradient hexagonal lenses. Silicone nose pads. Cabochon detailing at split temples. Capped ear pieces. 100% UVA/UVB protection. Can be fitted with prescription lenses. Made in Italy.